Attorney H. Michael White, Jr. helps Charleston SC families and businesses to buy, sell and refinance real estate with confidence. In South Carolina, state law requires an attorney to prepare and execute real estate closings. Aside from being the law, however, it’s just a good idea. For many of us, real estate is the biggest investment of our lives, and the legal and financial stakes are high. H. Michael White, Jr. protects his clients’ interests by carefully reviewing every detail of the real estate transaction. A real estate closing can be stressful. You will have dozens of questions and concerns. The time to address those concerns is before you sign the contract, so contact Attorney H. Michael White, Jr. today! Attorney H. Michael White, Jr. provides wills, living wills, healthcare powers of attorney and general durable powers of attorney for his Charleston SC clients. When we have passed or have lost the ability to express our wishes, our loved ones will be under considerable emotional distress. We can help relieve that anxiety by planning ahead and getting it in writing. Attorney H. Michael White, Jr. provides expert probate services, helping clients to consider every detail, and to plan for the future with confidence. Contact him to learn more. Charleston SC Attorney H. Michael White, Jr. assists clients in the creation of corporations and limited liability companies. Asset and liability protection is a prime concern for entrepreneurs and small business owners. So they incorporate or form LLCs to guard their personal assets and property from legal action. Taxes are another concern. To grow and prosper, small business owners need to find the simplest – and least expensive – way to fulfill their tax obligations. Working with the client’s tax attorney or accountant, Attorney H. Michael White, Jr. helps small business owners choose the right path to business success. Contact him to learn more. Attorney H. Michael White, Jr. provides careful, meticulous contract preparation and review for his Charleston SC clients. When preparing a contract, you must carefully consider every detail of the transaction. Before signing a contract, you must have it thoroughly reviewed by a legal expert who is committed to protecting your interests. These are two vital keys in conducting business safely, ethically and without unpleasant surprises. 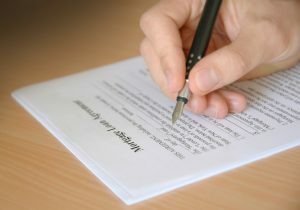 Again, the time to review a contract is before you sign it. So, know what you are agreeing to. If you’re not sure, contact Attorney H. Michael White, Jr. for assistance.